It's all happened with alarming speed. Just a month and a half ago we wandered into a kitchen design showroom and started talking ideas, then at 7am on Monday morning a big, monosyllabic bloke turned up with a crowbar and started tearing into the old kitchen with almost joyful violence. Bye bye leaky benchtops, uneven surfaces, faulty stove tops, constant fire alarm triggers (due to lack of rangehood), sticky drawers and knobs that unscrew themselves! I spent most of the day hiding upstairs as I found the whole process rather traumatic, but Phil nobly supervised things and made sure weird things weren't done in the name of haste. 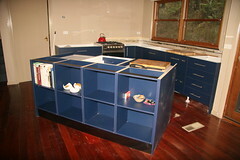 Once the old kitchen had been reduced to splinters, in marched the army with the shiny new blue cabinets and sparkling appliances! The blue looks great, and it's so nice having things that work. You can't see in the bottom photo, but we've got a bench-level fridge and freezer on the back of the island bench, so that's meant a fair degree of rationalising of refrigeratored items. We don't get benchtops for another week as the corian/staron people have to measure up after the cabinets are installed and level. So we're currently doing our washing up in the bathtub. But the appliances are working so we can cook. This morning at 6.45am (!!) 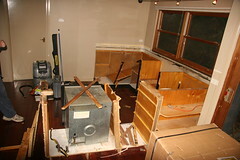 someone started installing the range hood, and we get the final electricals done on Friday.